One area of concern is "Category Three" experiments which may raise "very strong ethical concerns" and should be banned. 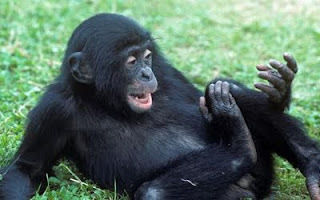 An example given is the creation of primates with distinctly human characteristics, such as speech. Exactly the same scenario is portrayed in the new movie Rise Of The Planet Of The Apes, in which scientists searching for an Alzheimer's cure create a new breed of ape with human-like intelligence. The report also acknowledges the "Frankenstein fear" that humanising animals might lead to the creation of "monsters". Currently research involving great apes, such as chimpanzees, is outlawed in the UK. But it continues in many other countries including the US, and British scientists are permitted to experiment on monkeys. Professor Thomas Baldwin, a member of the Academy of Medical Sciences working group that produced the report, said the possibility of humanised apes should be taken seriously. "The fear is that if you start putting very large numbers of human brain cells into the brains of primates suddenly you might transform the primate into something that has some of the capacities that we regard as distinctively human.. speech, or other ways of being able to manipulate or relate to us," he told a news briefing in London. "These possibilities that are at the moment largely explored in fiction we need to start thinking about now." Prof Baldwin, professor of philosophy at the University of York, recommended applying the "Great Ape Test". If modified monkeys began to acquire abilities similar to those of chimpanzees, it was time to "hold off". "If it's heading in that direction, red lights start flashing," said Prof Baldwin. "You really do not want to go down that road." Okay, I'm just as concerned as anyone about the potential for abuse, particularly when animals are used in scientific experiments. But setting that aside, and assuming that cognitive enhancement could be done safely on non-human primates, there's no reason why we should fear this. In fact, I take virtually the opposite stance to this report. I feel that humanity is obligated to uplift non-human animals as we simultaneously work to uplift ourselves (i.e. transhumanism). Reading this report, I can't help but feel that human egocentricity is driving the discussion. I sincerely believe that animal welfare is not the real issue here, but rather, ensuring human dominance on the planet. Ultimately, we have to ask ourselves, why wouldn't we wish to endow our primate cousins with the same cognitive gifts that we have? Human intelligence and complex language skills are our most prized attributes. The time is coming when we'll be ale to share these capacities with other animals. Well it does seem likely that the only way we'll uplift animals sometime this century will be to test stuff on them. They probably wouldn't appreciate that.